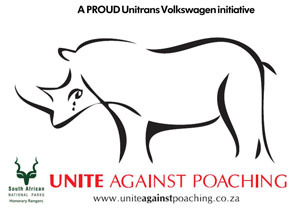 Unite Against Poaching (UAP) is an initiative established by Unitrans Volkswagen, in co operation with the SANParks Honorary Rangers, who felt that there was need to support the field rangers at the coal face and assist them in combatting poaching. 100% of all the funds raised are used in anti poaching projects within SANParks. UAP has realised the dream to equip Field Rangers, who come face to face with poachers, with the appropriate gear and skills to allow them to operate covertly within the National Parks to prevent poaching and successfully apprehend poachers. “Unite Against Poaching is delighted to endorse the Jenna B range of products in support of saving our precious rhinos from the ravages of poaching. We commend this initiative by a concerned young lady. Our youth are taking a stand to secure our rhinos for future generations and we wish Jenna great success with this exciting project. Thank you for caring and for making a difference.” said Linda Joyce, Marketing Officer at UAP.